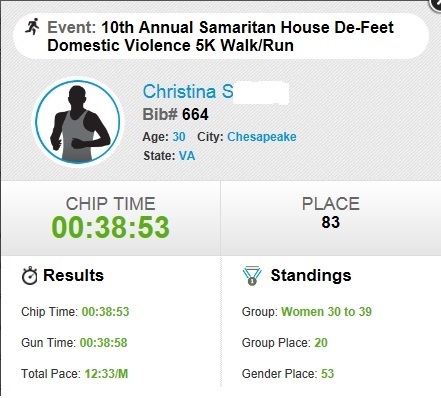 You guys have read about my goals for my first 5k for months now, and I am thrilled to announce that Sunday afternoon, I crossed the finish line over a minute under my goal time! You may remember that back in June, I had managed to do the full 5k in just under 50 minutes, and set a new goal of 40 minutes for the actual race. 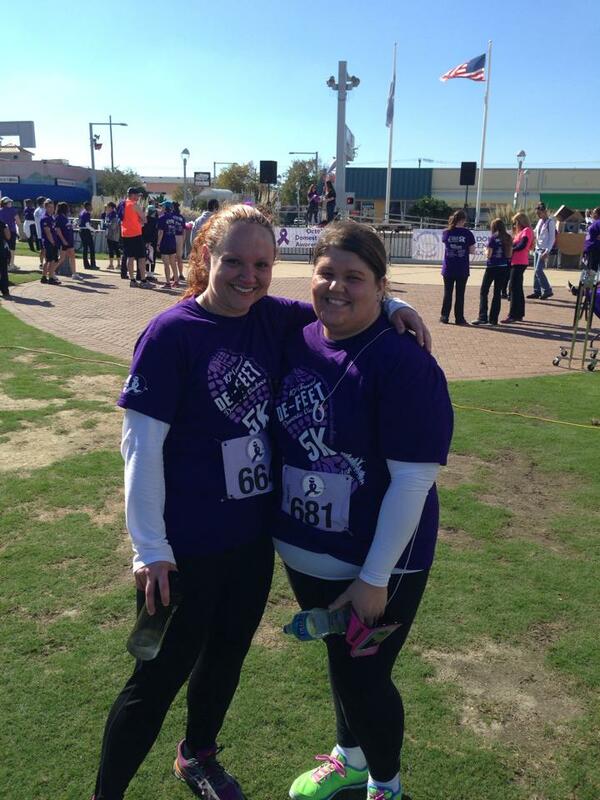 As of October 20, I completed 5k in 38 minutes and 58 seconds! I wasn’t able to jog the whole thing, but I hadn’t expected to; my main goal was simply to cross the finish line with the best time I possibly could. Considering that about six months ago, I was literally a couch potato and could barely walk a 20 minute mile without feeling miserable, completing this challenge is an amazing feeling. It wasn’t easy, especially with the road blocks put in my way by my own body. The fibro didn’t want me to do this and to be honest, there were many times that I doubted myself. I know that to a lot of people a 5k seems like a small thing, it is after all, only about 3 miles, and I imagine that most people in fair health could do it if they wanted to. Those of us with fibromyalgia know that even if we’re in otherwise perfect health (which we’re usually not), physical activity of any sort is an iffy venture, at best. We can never really gauge how we are going to feel on any given day, so setting up an actual training routine is nearly impossible. It took me six months to get myself ready for this race. The first few weeks of training were incredibly difficult; I don’t think I can adequately describe what it was like to someone who doesn’t have a chronic pain condition. My body did not want to cooperate, it was perfectly happy to sit on the couch and do nothing. Not only did I have to fight against my own self doubt, I had to fight my body’s insistence that I was hurting myself. Getting past the “payback pain” was an arduous process, but I will tell you now, I would do it all over again. The results are worth it. It took about 6 weeks, but I did finally reach a point where I began to feel better after a workout, rather than worse. The thing you have to keep in mind is that: I do not work out because I feel better, I work out to make myself feel better. I don’t just exercise on the days that I feel good; even on my worst days, I will force myself to go do something, even if it’s just a short walk around the neighborhood, because I now know that afterwards, I will feel better. I cannot put enough emphasis on how important that realization was to me. Those days where all you want to do is curl up with a bowl of ice cream and cry are the days that where you need to find a way to be active, even if it’s only for 20 minutes. I promise you that you will feel better. Your mental state will improve almost immediately because now you can be proud of yourself for not giving up, and eventually your body will realize that the activity actually does feel better than doing nothing. Alright, enough of the “get active” propaganda :). Another person that I’d like to mention is another very dear friend of mine, Aaron. Even though he had absolutely no reason to get up and go out to the race this last weekend, he was there to cheer both Heather and I on, and was even nice enough to hold on to our stuff for us. I can’t even tell you guys how much it meant to me to have two of my very favorite people there to support me on a day that a year ago I would’ve said would never happen. Even before the fibro, I would have never thought that I’d voluntarily participate in a race; after the fibro, I would have said it would be impossible for me to do at all. I’m so very glad that I was able to prove myself wrong.